The Ice Storm Warning went into effect in Cook, DeKalb, DuPage, Grundy, Kane, Kendall, LaSalle, Lake, McHenry and Will counties at 6 p.m. Some schools in the Chicago area announced early closings and the cancellation of after-school activities ahead of an Ice Storm Warning Tuesday. District 160 in Seneca Township and District 210 in Lemont announced schools would open late on Wednesday. The Ice Storm Warning went into effect in Cook, DeKalb, DuPage, Grundy, Kane, Kendall, LaSalle, Lake, McHenry and Will counties at 6 p.m., lasting through 6 a.m. Wednesday. 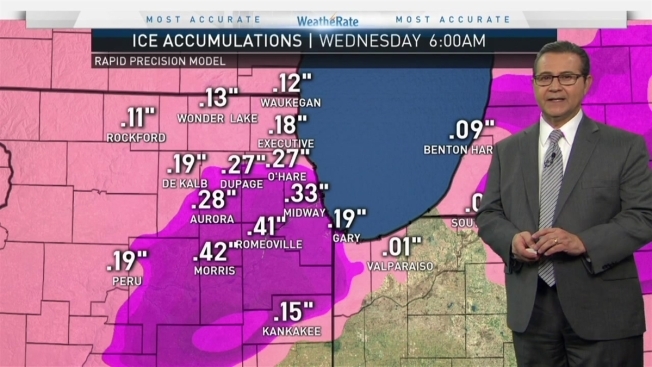 It's the first Ice Storm Warning for the area since 2009, according to NBC Storm Team 5. CALVARY CHURCH	ORLAND PARK	(TODAY) CLOSING EARLY AT 4:30 P.M.
CHURCH OF THE HOLY SPIRIT RELIGIOUS ED. PROG. SCHAUMBURG	(TODAY) NO EVE. CLASSES OR MTGS. COOK LIBRARY DISTRICT - ASPEN DRIVE	VERNON HILLS	(TODAY) CLOSING EARLY AT 5 P.M.
COOK LIBRARY DISTRICT - COOK PARK	LIBERTYVILLE	(TODAY) CLOSING EARLY AT 5 P.M.
DEERFIELD PUBLIC LIBRARY	DEERFIELD	(TODAY) CLOSING EARLY AT 5 P.M.
DIST #160 (SENECA TOWNSHIP HIGH SCHOOL)	SENECA	(TOMORROW) OPENING LATE AT 9:55 A.M.
DIST #210 (LEMONT TOWNSHIP HIGH SCHOOL)	LEMONT	(TODAY) AFTER-SCHOOL ACTIVITIES END BY 5:30 P.M.; (TOMORROW) OPENING LATE AT 9:30 A.M.
A Winter Weather Advisory was also issued from 6 p.m. to 12 a.m. Wednesday for Kankakee County in Illinois, plus Kenosha County, Wisconsin, as well as Lake and Porter counties in northwest Indiana, where less ice and more rain is expected. Significant icing is expected for areas mainly along and north of I-80, with ice accumulations between one-tenth to four-tenths of an inch expected. The highest ice amounts look to be along and northwest of a line from Streator to Morris to Joliet to downtown Chicago, Storm Team 5 warned. The National Weather Service strongly discouraged travel while the Ice Storm Warning is in effect, as roads will be dangerous.